Click the button below to add the 4" Rocket Masonry Heater Castle Build Kit to your wish list. This kit includes the Dragon Burner and specialized components you need to build a 4" Dragon Heater Castle Masonry Heater using chimney flue liners. This approach breaks new ground in rocket mass heater and masonry heater construction. The 4" uses only a single bell to minimize the footprint, and reduce overall cost. Using the dragon burner combustion system it burns the wood very efficiently (+90%) and then captures all the heat for slow release. Exit temperatures leave only enough heat for good chimney draft, typically 150F. Burning for 4-5 hours will provide 13 hours of heat. It provides the continous thermal heating without requiring a large footprint. It can be built in less than a day with no special skills. 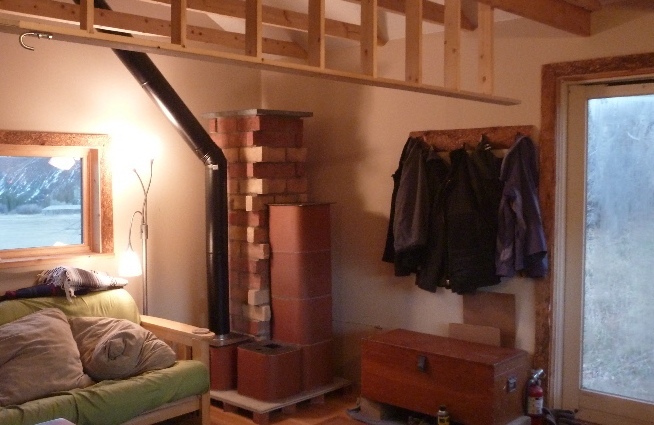 Most of the heavy components, the chimney flues can be aquired locally, saving shipping cost. It has low surface temperatures, similar to a radiator, providing a safer heating option. There is no barrel used, so there are no high temperature metal surfaces. It can be placed 6" from a wall. This count includes on 13x13 for a stove pipe exit like shown above. An alternative is to use a square 12"x6" duct adapter. In the picture above the 18x18 flues which are normally used for the bell were not used. Instead the bell was wrapped with recycled brick. The 13x13 flues are the most common and inexpensive. This approach save about $175 of the flue bill. You will need 2 caps, one for each tower of flues. You can purchase premade caps from us or supply your own. Heat Riser Cap - This is subjected to the most intense heat of the system, so must be made of suitable materials. Cement is not an option. If you do not wish to use one of our caps, you can use stone or steel. Depending on the stone you may want to consider still using some a ceramic blanket pad to shield the stone from the most intense heat it will reduce thermal stress on any decorative materials used, although it will do so at the expense of reducing the surface temperature. Some users want to keep it hot for emergency cooking. If you are going to use steel we recommend a thick steel (1/4") to minimize warping and you must use gasket between the flue and the steel. The steel and flue expand at diferent rates and using mortar only will result in cracking and a poor seal. Bell Cap - This cap is subjected to much less heat than the heat riser cap, but still requires either refractory or stone.